﻿ Dovetail joint for cages and boxes. Furniture assembly joints, pins and tails. Dovetail joints for furniture making. Swallowtail joint, dovetail woodjoint and fantail joints are all the same woodworking method. 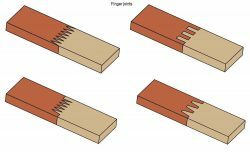 Joinery with interlocking fingers, pins and trapezoidal tails. Dovetail joint for cages and boxes. 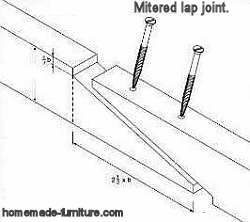 Furniture assembly joints, pins and tails. Free furniture plans » Joinery examples how to make joints in woodworking. 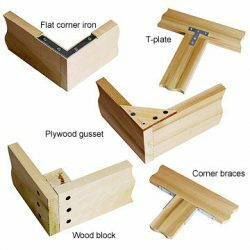 » Dovetail joint for woodworking. 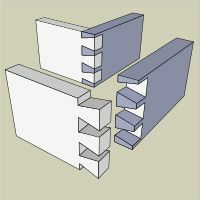 The dovetail is a strong joinery technique for boxes and drawers. There are no mechanical fasteners needed for this joinery method. This structure cannot become loose once all parts are fitted and glued together. The high resistance to pulling is a result of the interlocking parts with shape of a dovetail. Other names for this joinery method are swallowtail and fan tail. Dove tail types >> through, blind, mitred, lapped. Through and Plain dove tails are the same. The Through dovetail is also known as a plain dovetail. You can see the tail on both sides of the corner. 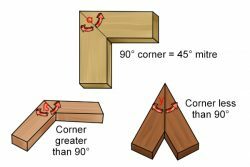 This joinery method has tensile strength in both directions of the joint. This is a solid structure, and its strength is even enhanced by the fitting of a bottom in the box or drawer. A through fan or dove tail is almost standard when cages for drawers are made. Even though it is a very pretty woodjoint, for most furniture it is desireable to have hidden or partly hidden joinery. It is for that reason that the through dovetail is normally used in non visible parts of the furniture. The half blind dove tail. This fantail joinery method serves mainly when you do not want the joint to be visible from the front. 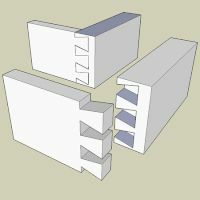 You will use this method mailny to make fronts for drawers. This construction will miss the sidewards strenth from a through dove / fan – tail. However that is not a problem, because the drawer cannot move sidewards anyway. As for all these joinery methods you will need special tools for this wood joint. A table router your the best option. A completely hidden joinery method is the secret mitred dove tail. These wood joints are mainly used in furniture in the higher price regions. When we state that it is completely hidden that might be slughtly incorrect. The joint is invisible from the outside. Is is however visible from the inside of the assembly. To hide the joints from the outside as well as from the inside you will have to use a secret double-lapped dovetail. Very similar to the secret mitered, but to hide all tails a small piece of wood is left on the outside. When two boards have to be connected at right angles you can use a sliding dove tail. 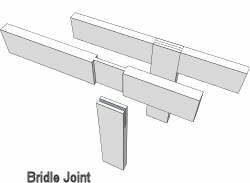 Following are some uses for the sliding version of a dovetail joint. To join shelves to cabinet sideboards. Cabinet and chests sides connection to the bottom. For horizontal division of shelves. To use in tabletops for expandable tables. Connect the front sides of drawers to the sides. This joinery method is also part of the assembly methods for guitars and violins. More methods for joinery in furniture making.